Most kids don’t enjoy practicing math drills, but you can make it fun with the Learning Resources Sum Swamp Game. This educational kids board game helps young students learn addition and subtraction as they race across the swamp, practicing math with every roll. The Sum Swamp game is best for children ages 5 and up, and you can play it with 2 to 4 people. In the box, you’ll find the game board, four swamp creature game pieces, two number dice and an operation die. During gameplay, children roll the two number dice and the operation die. They then must do the math equation to figure out how many spaces to move. As players navigate through the swamp, they’ll encounter various creatures, face challenges and maybe even find shortcuts. According to reviewers, the Sum Swamp Game is sure to be a hit with children who are learning basic math skills. Users love the high-quality game pieces, and many say their kids ask to play again and again! The Sequence Game is one of today’s top board games for adults, but it can be tricky for younger kids to learn. If your children want to get in on the fun of this strategy-based game, get them Sequence for Kids, a simpler version of the popular game that’s sure to keep the whole family entertained for hours. Sequence for Kids can be played with 2 to 4 people, and it’s best for children ages 3 to 7. With the game, you’ll receive a folding game board, 42 playing cards, multi-colored playing chips and instructions. Instead of traditional playing cards, however, the deck contains pictures of animals — perfect for little kids! To play, each person puts down a card from their hand and places a chip on the corresponding game board space. The object is to get four chips in a row. Reviewers say it’s a fun matching game that’s easy to understand, meaning even young children can get in on the fun. If you prefer to foster collaboration among your kids rather than competition, you should look into Outfoxed! 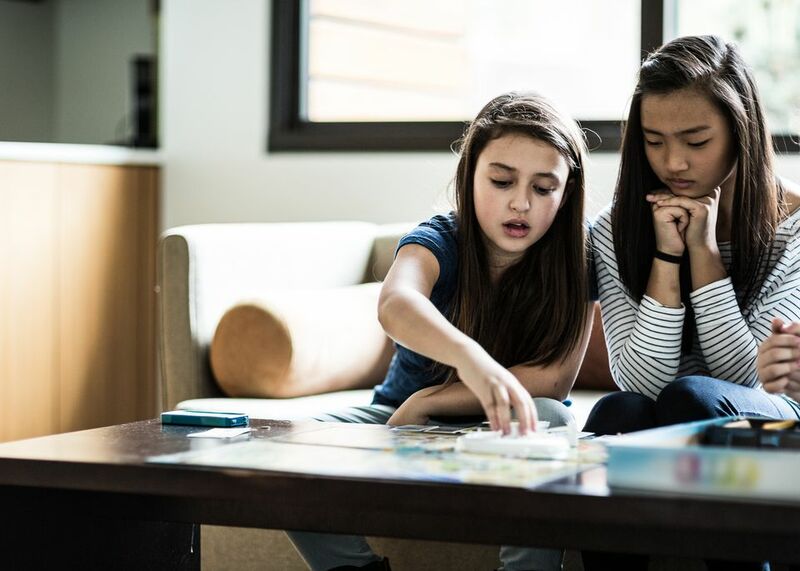 This cooperative game encourages players to work together to figure out who stole Mrs. Plumpert's prized pot pie as they navigate around the board. Outfoxed is best for children ages 5 and up, and it can be played with 2 to 4 people. The object of this whodunit-style game is to figure out who stole the pot pie. Players will make their way around the board, collecting clues, using the special evidence scanner and ruling out suspects. Will you figure out who the culprit is in time? Many reviewers say Outfoxed is like Clue for kids, and they love that it teaches critical thinking skills and logic, all while fostering teamwork among players, since there’s no winners or losers. You can’t go wrong with this all-time favorite kids board game. Candy Land has been a classic family board game for many years, and your little ones will love making their way through the magical World of Sweets. Candy Land is best for children ages 3 to 6, and it can be played with 2 to 4 people at a time. In the box, you’ll receive a colorful game board, four pawns, a card deck and instructions. The premise of the game is simple: Make your way along the rainbow path and be the first to reach King Kandy’s castle. Kids will encounter fun surprises as they travel through magical locations like the Peppermint Forest and Chocolate Mountains — be wary of certain cards that can send you back, though! Reviewers love that this classic game is the same one they played as children, and many say there’s an element of nostalgia in watching their own kids play and enjoy Candy Land. Here’s another all-time favorite board game that’s been adapted specially for children. Scrabble Junior comes with a two-sided game board that has two difficulty levels, both perfectly suited for younger players. Scrabble Junior is designed for children ages 5 and up, and you can play with 2 to 4 people. The double-sided game board features a letter-matching activity for younger players, allowing them to practice their alphabet skills. The game comes with four fun character tokens to help keep score and to keep young players engaged. On the other, more advanced side of the board, there’s a classic Scrabble setup where kids can start building their own words in the traditional crossword-style game. Scrabble Junior is great because it grows along with children, making it a fun, educational board game that will stay in your family for years. As an added bonus, it’s a great way for young students to practice spelling and reading! Only have two players? Don’t worry! There are plenty of fun 2-player board games for kids, including the Chutes and Ladders Game. In this classic game, players have to climb to the top of the gameboard without sliding down the perilous chutes. Chutes and Ladders is for kids ages 3 to 7, and it can be played with 2 to 4 people at a time. It comes with a gameboard, a spinner, four pawns and instructions — everything you need to enjoy an engaging game with your family. In the game, players take turn spinning numbers and navigating up the board toward the top square marked 100. However, along the way, you may land on a ladder, which lets you climb ahead, or a chute, which sends you back down the way you came. Chutes and Ladders is great for students learning number recognition, and many users say it keeps their young children engaged for hours. It’s never too soon to start teaching kids to love board games! Teach your toddler the basics with Wonder Forge Richard Scarry's Busytown, Eye Found It, a simple I-spy game designed just for young children. Eye Found It is a cooperative board game for kids 3 and up, and it can be played with 2 to 4 people. The oversized game board is more than 6 feet long, and the object of the game is to work together to make it across the board. Kids will be tasked with finding hidden objects like buckets, traffic lights, flags or ladders on the big game board — the more they find, the faster they can make it to the end of the board and win! This I-spy style game is easy for kids to pick up, and reviewers love that it teaches teamwork to young children. Many say Wonder Forge Richard Scarry's Busytown, Eye Found It is fun for the whole family, so you won’t get bored playing with your toddlers.